This year we decided to go to the Border Challenge in Albury. 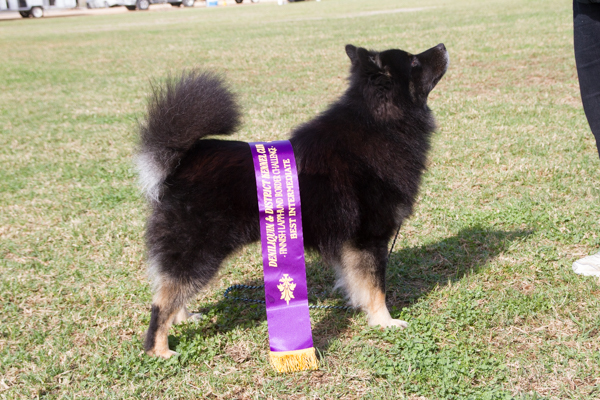 This show has the NSW and Victorian Finnish Lapphund clubs competing against yeah other for fun. It was a big entry of lappies with 48, 50 and 50 dogs entered on the three days of the show. 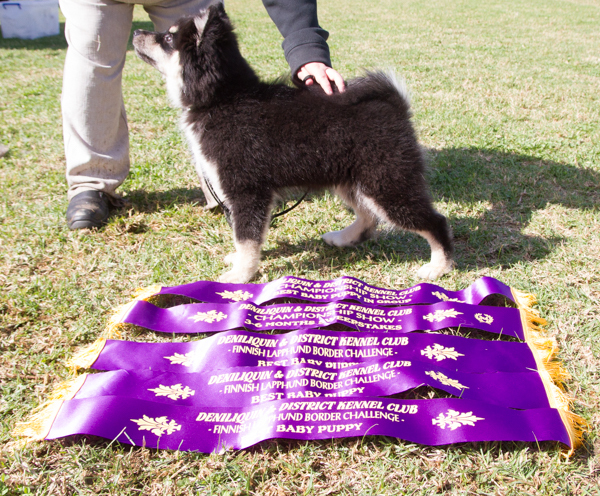 On the First day under judge Mrs H Furber (NSW) Ukko won Intermedaite of Breed and Eevee Baby Puppy of Breed. 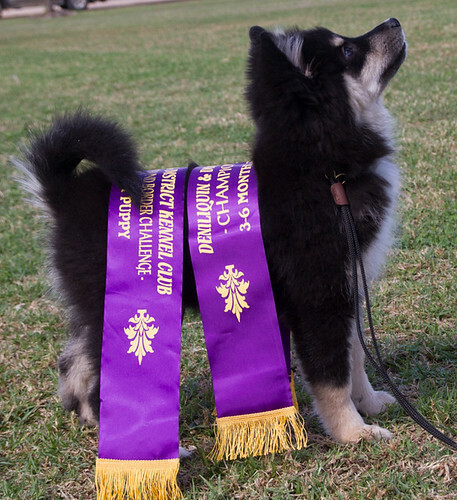 On the Second day under judge Mrs E Benson (NSW) Eevee was awarded Baby Puppy in group. On the last day Eevee was awarded 3rd in Baby Puppy Sweepstakes under judge Mrs H Furber (NSW) and Baby Puppy of Breed under Judge J Black (Vic). In the end Victoria won the competition for the weekend and Eevee came home as first place as the dog who contributed the most points to her state over the weekend. It was a very fun weekend. 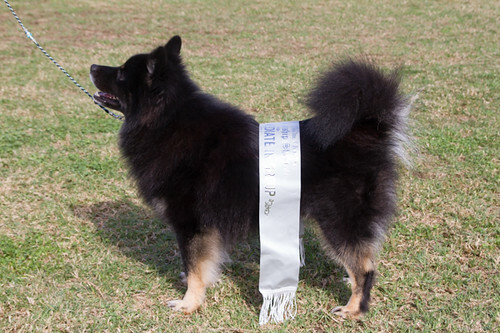 At the Ovens Valley show in Myrtleford on the 12th of April 2015 Ukko was awarded an 8 Point Dog Challenge and Runner up Best of Breed as well as Intermediate in Group under judge Jill Hocking. Neme did not want to wait until 2015 to bring her babies into the world and decided to have them in 2014. 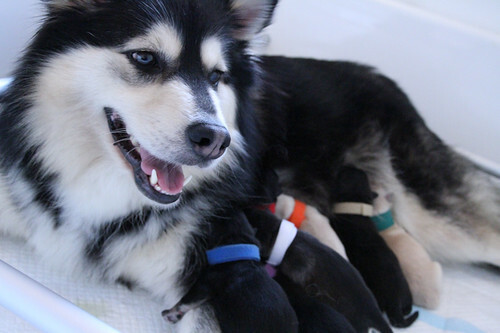 On the 30th of December we welcomed into the world 7 new little lappies into Australia, 3 boys (One Domino, One Cream, One Wolf Sable) and 4 girls (One Domino, One Cream, One Wolf Sable, One Black and Tan). Big thanks to Meagan who helped to bring them into the world. I am very pleased to announce the safe arival of the first Litter at Lumottu. Between our Lovely girl Alera (Janoby Ever so Wild) and Janoby Kennel's Larry (Watersedge Secret Agent) they had 7 lovely puppies. 4 Boys and 3 girls. 2 Black/Tan and White boys and 2 Cream Boys and 2 Black/and White Girls and 1 Domino Girl. 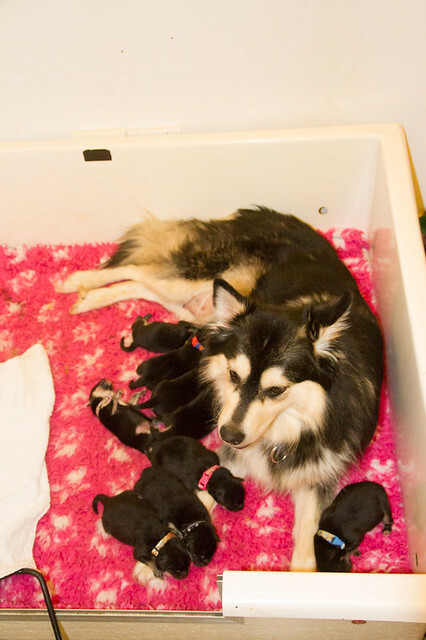 Mum and Pups are doing well. I am very pleased to announce my little girl Alera has managed to gain her Australian Champion title and can now be known as Ch. Janoby Ever so Wild. Along the way we have had some nice wins including a few Junior's in Group. Alera is a wonderful girl who I am proud to own and show. We are looking forward to continuing to improve into the future. It has been a Wonderful last few weeks showing for Alera and myself. 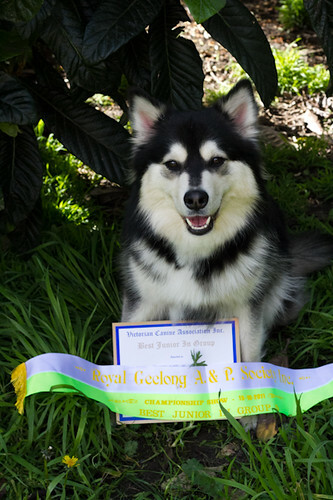 It stared at the Royal Geelong Show where Alera won her first ever class in group when she was awarded a Junior in group. She followed this up with going Junior in Group again the next weekend at the Bendigo Agricultural show. We are having lots of fun showing to together and are continually improving. Alera is maturing into a lovely girl both out of the ring and in it. 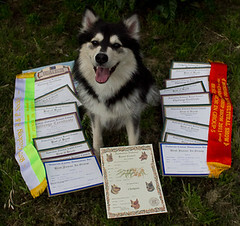 Welcome to my site dedicated to my Finnish Lapphund Kennel, Lumottu. My dogs are a very special part of my life. They teach me new things everyday and have heaps of love to spare. Lappies have proven to be the perfect dog for me. They are intelligent, healthy and affectionate. 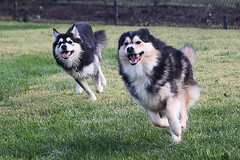 They are a perfect dog for families and do well in the obedience ring and dog sports. 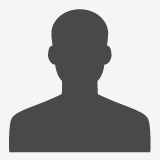 Many thanks to Caitlin for making this site for me.